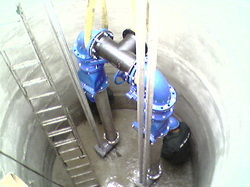 JSC "Automatizacija" manufactures, installs pumping stations collect and meeting the needs of various customers. Water pumps are designed to provide clean water to residents and industrial facilities. Sewage pumping stations are designed to remove due to human activity or natural phenomena caused by contaminated or simply excess water. The most modern sewage pumping stations are installed in underground tanks that are equipped with submersible sewage pumps. The tanks can be made of concrete, fiberglass, polyethylene or other resistant to compression and water exposure. According to the type of sewage pumping stations are divided into surface or storm water pumping stations, domestic, municipal and industrial waste water pump sewage pumping stations. Surface water pumping station usually applied fairly clean, for example. storm water contaminated by suspended materials pass. Household, municipal sewage pumping stations used in household sewer networks, catering facilities, crowded places and similar objects. Industrial wastewater pumping stations are installed according to one or another specific industry requirements. Fish industry requirements will be some form of milk, meat or metallurgical different. By pumping efficiency can be from a few cubic meters per day to a few or even tens of thousands of cubic meters per day. Selecting and offering the customer installation we take into account all the above mentioned features.